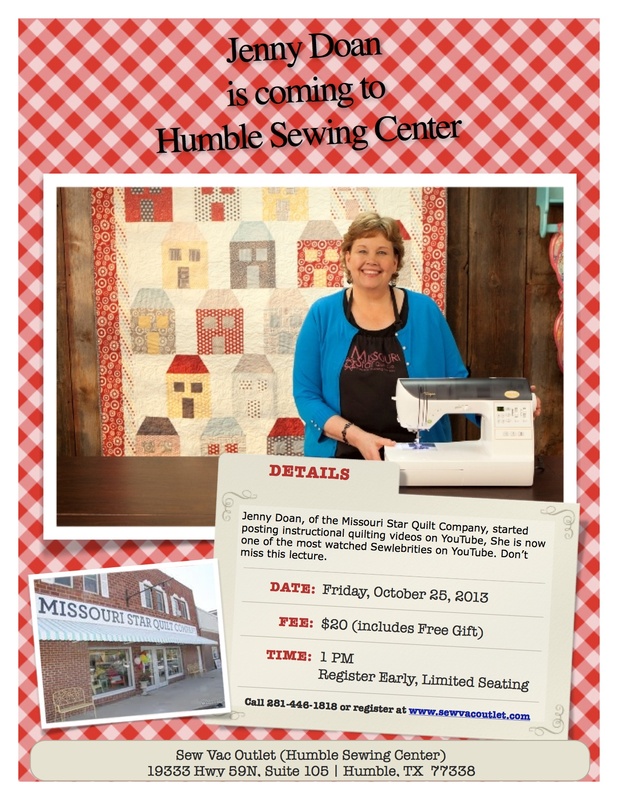 Meet Jenny Doan at Humble Sewing Center!!!! She’s a Sewing Sensation on YouTube, a new Sewlebrity Spokesperson for BabyLock and she’s COMING HERE SOON!!! We are excited to have her with us for an exclusive Sewing/Quilting Lecture and autograph session. Each attendee will receive an issue of Fons&Porter’s Quilting Quickly Magazine featuring 19 Easy Projects by Jenny Doan. This entry was posted in Project Tutorials, Video Library, Videos: Sewing Tutorials & Tips and tagged Jenny Doan Sewing Tutorial on October 12, 2013 by Jenny Gabriel. 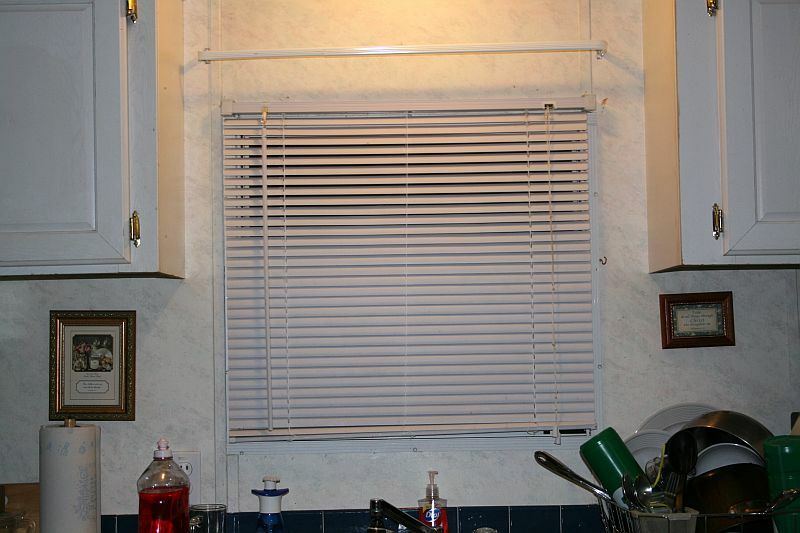 Quick and Easy Kitchen Curtains…. I’ve had a busy past few days holding classes for a couple of new sewing students in my home. It’s always a pleasure to meet new people and especially to help them get started with the love of sewing! Anyway, getting to today’s topic, a while back, my mom gave me some fabric that she thought might go well in my kitchen. Some of it is becoming an apron for her and some of it has just become curtains for my naked kitchen window. Yay! At the end of this post, I’m sharing a link to a free Sewing with Nancy video tutorial that shows how to make these in short order. Honestly, I spent maybe an hour from start to finish and I think they dress up my window nicely. Ok, here’s the video tutorial! The only thing I added that wasn’t in the video, was that I needed to make a couple of tie-backs. 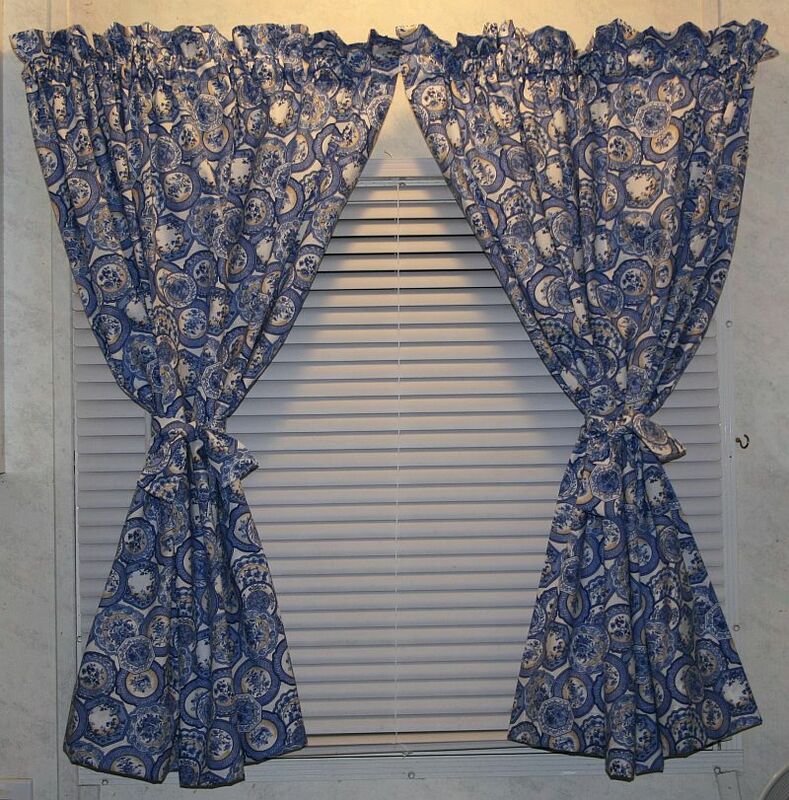 Otherwise, these curtains would have been an overwhelming wall of blue plates. For the tie-backs, I cut a long strip of fabric that was 5 to 6 inches wide and was 45 inches long. I folded the long strip with right sides together and stitched the long edge. Then I turned my fabric tube right side out, pressed it, and cut it in half so I’d have 2 tie-backs. I hemmed the raw ends and tied them around my curtains. Easy-peasy and they are quite functional. I hope you enjoy this short tutorial and perhaps it will help you dress up a window of yours, too! This entry was posted in Home Decor, Project Tutorials, Video Library, Videos: Sewing Tutorials & Tips and tagged curtains tutorial, home decor projects, sewing on January 31, 2012 by Jenny Gabriel. Heads up ladies! This post is two-fold. For those of you who own Janome machines, I’m linking to 3 different Janome video clips that focus on buttonholes and sewing on buttons. Hopefully, the information demonstrated will also shed some light on the matter for those of you who own various other brands of machines. And, I’m also posting a VERY helpful video from Nancy Zieman demonstrating: making buttonholes, safely cutting them open, properly placing them on your project etc. As usual, Nancy is the Queen of sharing lots of wonderful tips! We're outside for this picture, so I could only safely show you one of the two buttonholes! How Long Have You Been Sewing: I first started sewing with my Grandma’s needle and thread at the age of 5. But, I didn’t really pick up sewing until 1997 when she passed away and bequeathed me her entire sewing room, machines and all. Since then, I have become quite the sewing junkie. Why did you want to commit to The Sew Weekly Challenge: I’ve been following along from the sidelines for a while now, and decided it was time to join in on the fun. I’m also hoping to bust my fabric stash by sewing out as many of the upcoming challenges as possible. What do you love most about sewing garments: I love the entire creative process and being able to customize the fit for my short waisted, small bosomed, pear shaped body. What do you hate most about sewing garments: I hate being reminded that I’m short waisted, small bosomed, and pear shaped. JK. The only thing I hate about sewing garments is that I don’t have the luxury of unlimited time to sew. What do you want to accomplish this year with regard to the challenge: I want to expand my sewing skills and see if I can produce something worthy to achieve the spotlight on the Sew Weekly. Your biggest non-sewing goal of 2012: I want to find a better balance between work and play. I’m such a type-A personality that I will work, work, work and forget to take time to relax, play, and enjoy the people in my life that mean most to me. Another blog I that I enjoy reading because it’s so fun to follow her sewing adventures and sense of humor is: Stacie Thinks She Can. I also appreciate the content found at anna maria horner and colette. My favorite garment of 2011 is the wrap skirt I made from McCalls pattern 5430. During 2011, I made several garments, but aside from my favorite pair of pj’s, I wear this skirt the most. It was quick and easy to make. I like the fit, the waist tie and the button up closure. I love these waist ties! Skirt has 2 Buttons in waistband to keep the wrap skirt from slipping down while wearing. This entry was posted in Clothing, Project Tutorials, Sewing FYI, Tips/Techniques FYI, Video Library, Videos: Sewing Tutorials & Tips and tagged buttonholes, sewing on buttons by machine, videos for sewing buttons on January 12, 2012 by Jenny Gabriel. Considering how often Texas weather changes and considering that maybe you are a reader living in a colder region than Texas, I figured that it’s ok to post this scarf project sooner than later. Right? Right! This project is perfect for the beginner who is just learning to sew AND/OR it’s a great gift to give to loved ones who’s birthdays are during the cooler months. 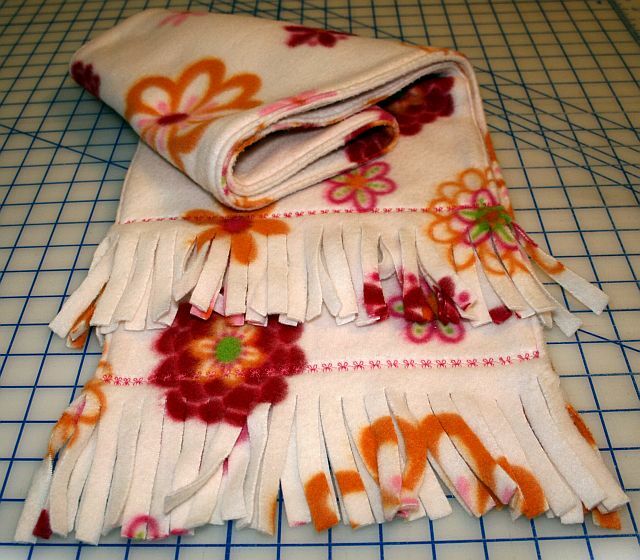 And, if you’d like to see a neat trick to help make cutting all that fringe an “easy as pie” job, then take a few minutes to watch Nancy Zieman’s video tutorial for making some fringed fleece blankets. Yes, this blog post is just full of surprises and bonus projects! Nancy shows you step-by-step how to make quick low-sew and no-sew fleece blankets. This entry was posted in Accessories, Project Tutorials, Video Library, Videos: Notions & Accessories Tips, Videos: Sewing Tutorials & Tips and tagged free sewing projects, how to use a rotary cutter, scarf tutorial on January 11, 2012 by Jenny Gabriel. Easy Pillow Case Dress Tutorial – w/ Elastic, Bias Tape, and Ric Rac! I hope you and yours are enjoying a wonderful season of fun, family, food, and fellowship! It would be so easy to add a cute embroidery design or applique to the front of these little dresses! This project is perfect for using up your extra fabrics and it’s a great way to touch a needy child’s life with love from halfway around the world. Contact me to share pictures of your completed dresses and I’ll share them on the blog! The new year’s almost here! This entry was posted in Sewing FYI, Tips/Techniques FYI, Video Library, Videos: Sewing Tutorials & Tips and tagged hemming, pillow case dress pattern, ric rac, Sewing FYI, using bias tape on December 26, 2011 by Jenny Gabriel. As Christmas draws near, I am steadily working on those last few gifts that are not quite finished…. If you are looking for something special to give a friend or family member this year, but you are feeling short on time, why not try making some embellished towels? In this video clip from Nancy Zieman, you will see how to use the Flower Stitch Foot and also the Ruffler Foot to make some beautiful transformations to an ordinary kitchen towel. COFFEE!!! I NEED MORE COFFEE!!! By the way, take a look at these slippers! These are a downloadable PDF pattern I found online. Click the image to go there and purchase. The pattern is half price for the holidays! This entry was posted in Home Decor, Videos: Notions & Accessories Tips, Videos: Sewing Tutorials & Tips and tagged how to use flower stitch foot, how to use ruffler foot, presser feet on December 20, 2011 by Jenny Gabriel. Is my virtual sewing mentor, Nancy Zieman, following my blog posts and copying my projects? Not likely, but, creative minds must track on the same wave lengths or something because, the same day I posted my patchwork place mat tutorial, she posted a clever method of quilting a place mat. Nancy’s video clip was so helpful, I just had to show it here. I’m calling this post “Part 1” because, in “Part 2”, I’m going to show you a nifty way to make and apply the binding for the place mats that are featured in Nancy’s video clip. Cut 2 fabric layers and 1 batting layer 20″ x 14″. Use chalk to mark bias lines on placemat. Stitch along one marked bias line. Turn the placemat 1/4 turn, stitch along next marked bias line. Repeat until all marked lines are sewn. Trim placemat to desired size. Use your favorite binding technique to apply binding around edges. This entry was posted in Featured Machines & Cabinets, Home Decor, Project Tutorials, Video Library, Videos: Notions & Accessories Tips, Videos: Sewing Tutorials & Tips and tagged diy place mats, Nancy Zieman videos, Sewing FYI on December 9, 2011 by Jenny Gabriel.